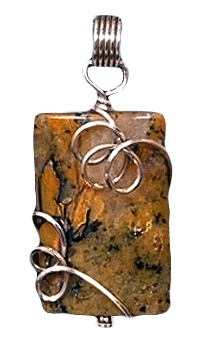 Another bead from the same strand of jasper. Love the variety in color! This bead brings to mind a smear of mustard on greens, cut into a rectangular shape and measures 30 mm x 19 mm. Wrapped in sterling silver wire. Finished size is 46 mm x 22 mm. Weight is 0.3 oz.